Join the many Triskadekaphiles* who stay with us year after year. Enjoy spacious and luxurious accommodations at our air conditioned villa located in the oceanside community of Lighthouse Beach Resort. Completely equipped accomodations for divers, including a gear rinse sink and drying rack in our front yard! We offer discounted air/Nitrox packages and you can even dive right from our beach. Windsurfers will love that we're one of the closest rental villas to Lac Bay. Unfortunately, we only get to beautiful Bonaire a few times a year, so we open up our home to others who enjoy this wonderful vacation mecca! 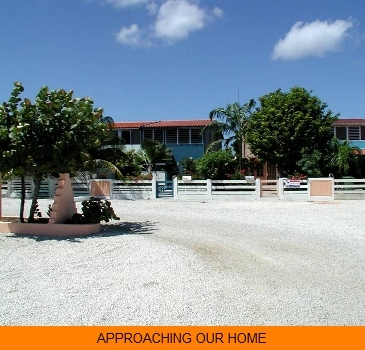 We are just minutes from town, shopping, casinos, restaurants, Salt Pier, the Southern Dive Sites and Bonaire's premier windsurfing area at Lac Bay. Contact us for a detailed quote on the best vacation value in Bonaire. Prices are exclusive of Bonaire Tourist Tax and $75.00 Cleaning Fee. Long Term Rates Available upon Request for greater than 2 week stay. Direct flights from Houston, Newark, Atlanta, Miami and Amsterdam. Connecting flights through Curacao and Aruba. $109.00 per night (1-2 persons). $12.00 per additional person per night (up to 5 persons). Includes accommodations only on a nightly basis. Bonaire Tourist Tax and fees extra. Air conditioned master BR with queen bed and private bath. Air conditioned second BR with two single beds and private bath. Couch and blow-up mattress for extra person.